Queensland’s perfect bucket list is full to the brim with holiday escapades: coastal beauty, tranquil hinterland, remarkable wildlife, outdoor adventures, delicious produce and a fabulous wine and dine scene. The famous ombre hues of Lake McKenzie are a must on every envy-inducing Instagram itinerary. Strike a pose on the silica white sands, dive into water so clear you can’t see it, and float your cares away in this picture-perfect, perched dune lake. 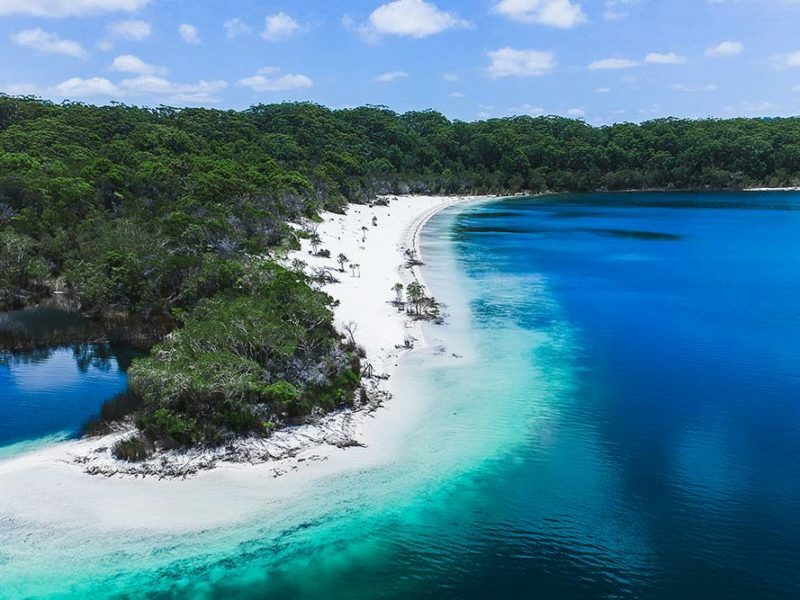 The Butchulla people’s name for Fraser Island is K’gari, which means paradise – and once you get here and see this beauty for yourself, you won’t want to leave. Enjoy a bush tucker-infused degustation at the award-winning Seabelle Restaurant, while the kids go bush – literally – at Kingfisher Bay Resort’s renowned Junior Eco Rangers program. You can discover a range of new flavours that incorporate local indigenous fare, while the kids are busy exploring the terrain where your dinner was grown. Hit the sand tracks, hard! Get lost on the 1200 kilometres of tracks that traverse the world’s largest sand island. Walk through ancient rainforest growing in the sand and make your way to more than 100 freshwater lakes hidden within this World Heritage-listed gem. Let the pros (Fraser Explorer Tours) navigate the tides and tracks on a 4WD tour, have a go yourself and drive it like you stole it (to avoid getting bogged), or don some sturdy hiking boots and sweat your way across the Great Walks of Fraser Island. 75 Mile Beach on Fraser Island is a gazetted highway, where you can cruise for hours – passing wild dingoes and some of the best fishing spots in Australia. Watch out for planes landing while you drive, as this is one of only two places in the world where planes take off and land on the beach. Park up in the sand and catch a scenic flight with Air Fraser Island for an epic drive-and-fly experience in the wild! While there are many places you can see the whales migrating along Australia’s east coast, there is only once place where they stop to play: the calm waters on the sheltered western side of Fraser Island, known as the whale-watching capital. Here, you can even dive in for the swim of a lifetime, right alongside a 30,000-kilogram oceanic friend. The five-star Oceans Mooloolaba is perfectly positioned across from Mooloolaba Beach. All 46 exquisite suites and penthouses encapsulate state-of-the-art facilities and cutting-edge, smart technology. All Oceans apartments are architecturally unique to allow maximum balcony area and exposure to unsurpassed 180-degree views. Oceans boasts a movie theatrette, heated pool, spa, steam room, gymnasium, daily maid service, luxurious bathroom amenities and Nespresso coffee machines. Mooloolaba is full of bucket-list activities including a visit to the famous Australia Zoo and whale watching. Perfectly situated 45 kilometres from Brisbane in the rolling hills of Ocean View, along the Mount Mee tourist drive, is a family owned winery and brewery offering an experience to suit every occasion and season. Ocean View Estates has some of the best cellar door experiences around. Choose elegant dining in the beautiful a la carte restaurant or a laid-back picnic among the vines. Take in the smells of fermenting wines and brewing hops on a tour or enjoy a food, beer and wine pairing experience. For something truly special, arrive in style by helicopter or explore the property on horseback. Meet the chef who will share his love of food and be drawn into the rivalry between winemaker (dad) and brewer (daughter) as they compete to bring you a glass of their best. Spoil yourself and stay overnight in a vineyard cottage. Once you’ve seen the spectacular surrounds one day will never be enough. The Bundaberg Rum Visitor Experience is a world-class attraction, made to celebrate Australia’s iconic Bundaberg Rum. Newly refurbished, the Visitor Experience offers something for everyone; whether you prefer to take your time through the interactive self-guided museum, or choose to jump on a guided tour deep into the heart of the fully operational Bundaberg Rum Distillery. In an Australian first for a rum distillery, visitors also have the opportunity to craft their own personalised blend on the Blend Your Own Rum Experience, where you will walk away with two bottles of your very own premium rum. One to keep, and one to enjoy.